Back in February, we postponed celebrations for the tenth anniversary of our Freedom of Information site WhatDoTheyKnow, because of extreme weather conditions. Gales and snow had shut down public transport; guests from further afield were unsure they’d make it to our London venue. Little did we know that our rescheduled event would face its own exceptional circumstances. Not only did we find ourselves at the other end of the thermometer, with the hottest temperatures of the year thus far, but we were also competing with England playing a World Cup match. All this being so, we were glad to see so many people turn out to help us celebrate — though it was pointed out that the Venn diagram between FOI enthusiasts and football fans might have a fairly small overlap. We’ll get our Research department on to that, at some point. The party took place at Newspeak House, the Bethnal Green hub of Civic Tech and innovation. Playing softly in the background was our specially-tailored FOI-themed playlist. 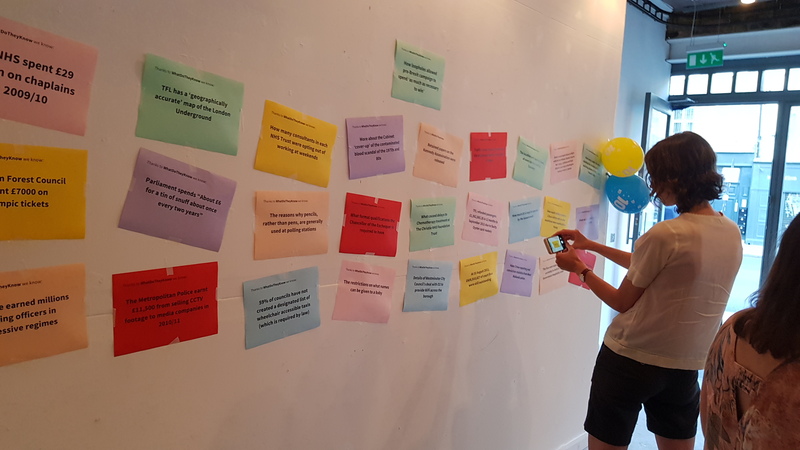 We’d decked the room with some rather unique — but meaningful — decorations: a selection of information uncovered by WhatDoTheyKnow’s users over the past decade (see photo, above), and screenshots of the many FOI sites running on our Alaveteli software around the world. Talking of Alaveteli sites, we were delighted to welcome among our guests Andreas Pavlou who previously worked with AccessInfo, the organisation who run Europe FOI site AskTheEU, and Claude Archer from Anticor, who run Belgium’s Transparencia.be. Claude actually drove, without incident, all the way from Brussels — only to scrape against the kerb right outside Newspeak House and get a flat tyre. But mySociety is not just a collection of weedy developers, you know. Well, ok, fair enough, until recently we were just that — but since Georgie joined our ranks a few weeks ago, it turns out that we now have a highly practical colleague who can change a wheel. And that’s just what she did. That drama aside, the party went smoothly. There were cakes, of course. Then some mingling. It was great to meet many WhatDoTheyKnow users, and especially those who employ the site for their campaigns. And on to the presentations. 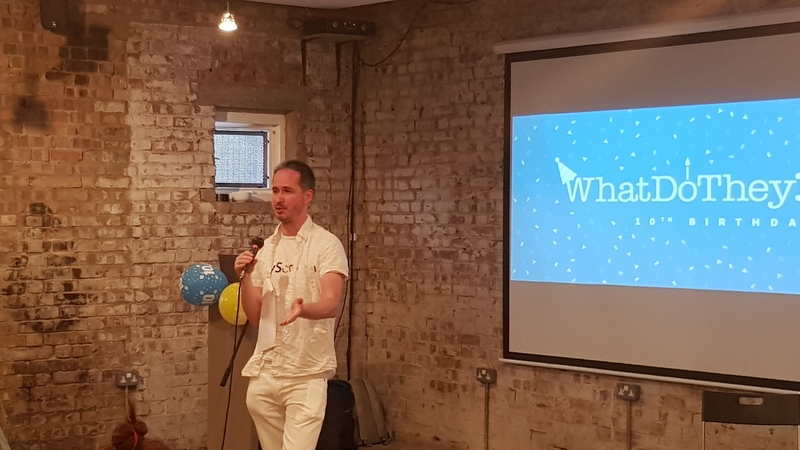 WhatDoTheyKnow’s Richard Taylor spoke about what it is like to be a volunteer on the site, and the kind of tasks they deal with in keeping the service available for everyone, not to mention free from litigation. You can read his talk here. 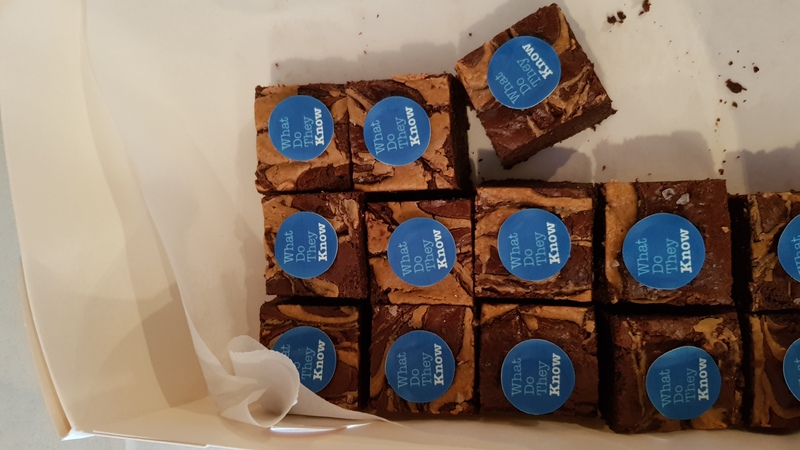 We interviewed Francis Irving, who was one of two people to suggest that mySociety build an FOI site when we had an open call for ideas — and who then went on to help build it. Much as we enjoy mySociety’s current status as an established organisation, Francis’ descriptions of our early days and ‘punk’ attitude were rather beguiling. 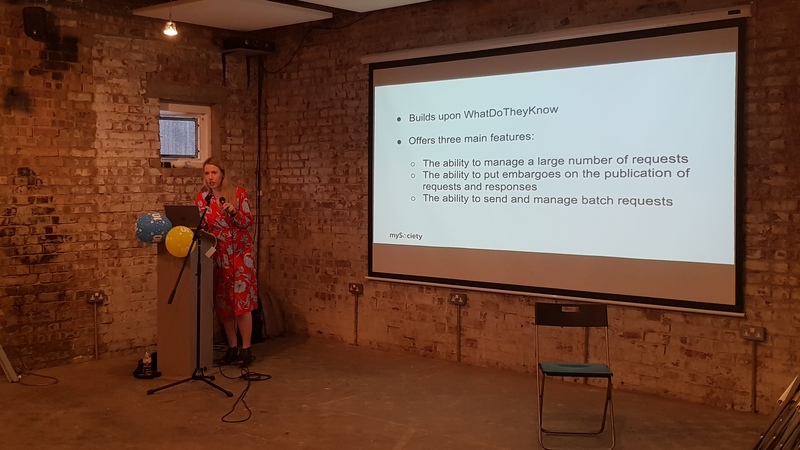 Finally, investigative journalist Jenna Corderoy shared her experiences of being one of the first people to try WhatDoTheyKnow Pro, our toolkit for FOI professionals and activists. In a stroke of incredible timing, she mentioned a story which she’d been working on, saying that she knew it would break soon, but it might be weeks or even a year before it did. We woke up the next morning to hear that this very story was the BBC’s main headline for the day. Watch this space, because we’ll be asking Jenna to fill us in with some more background, and we’ll be sure to share it all here on the blog. Oh, and in case you’re wondering… we did eventually switch the big screen over to the football, and all those Civic Tech geeks did actually get caught up in watching the penalty shoot-out decider. I guess the Venn diagram stretched a little bit that night. Thank you so much to everyone who came along: we hope you had as much fun as we did.